✔INSTANT FREE UP MEMORY：Photos/Videos/Audios can be recorded to the iPhone memory stick directly --- 64G external memory expansion. Free up memory on your iPhone/iPad. 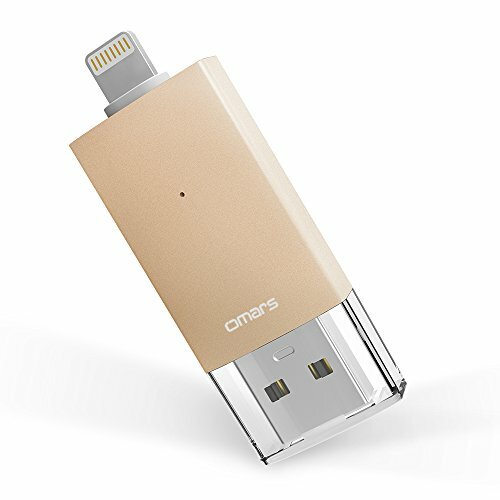 ✔AMAZING SPEED USB 3.0 FILE TRANSFERS:Directly plugs into your lightning port and USB port; 80 MB/s reading and 40 MB/s writing speed in USB end. Makes files transmission much easier on the go. ✔FREE USER-FRIENDLY APP: The free "Witstick" app will pop up automatically when connected to the ios devices. Support all major format so that you can stream videos/music/document files directly from the iPhone flash drive. ✔More Features in Witstick :1)Password & Touch ID can be set to secure individual file on Omars flash drive(Witstick -- in app storage). A safe place to protect your private data.2)Share document to the social media directly. (Facebook,twitter and so on)3)One Touch backup. Backup all contacts/images/audios/videos at one click. 4)Support exFat, enable you transfer files larger than 4GB. ✔QUALITY GUARANTEED : Apple Mfi Certified, works with any apple device that uses the 8-pin lightning connector.If you have any questions please contact our customer service anytime at contact@omars.co and we will do our best to help you.Please note: 1.Media files downloaded from iTunes or other 3rd party apps can not be transferred, as these files are DRM (Digital Rights Management) protected. 2. Please remove iPhone case to ensure the best connection. If you have any questions about this product by Omars, contact us by completing and submitting the form below. If you are looking for a specif part number, please include it with your message.